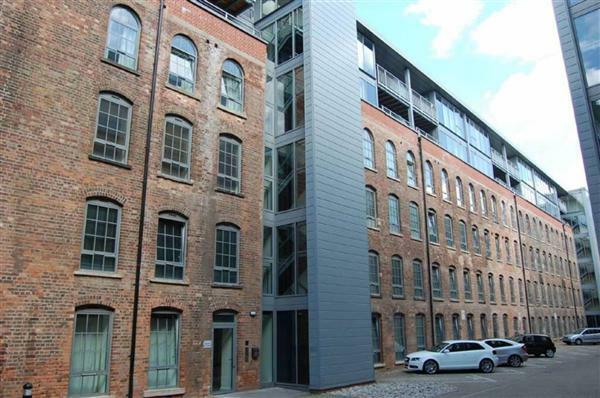 Stunning First Floor city centre two bedroom apartment with parking in the desirable canal side development of The Hicking Building. The accommodation briefly comprises two double bedrooms, bathroom and en suite with open-plan kitchen/reception & secure underground car parking space. Situated on the first floor, the apartment benefits from lift access and electric door entrance and intercom system. One secured underground allocated car park space. Wall mounted electric heater, two storage cupboards; one containing a hot water cylinder. Fitted with a matching range of base and eye level units with worktop space over, stainless steel sink with mixer tap, integrated fridge/freezer and dishwasher, electric fan assisted oven, four ring electric hob with extractor hood over, double glazed windows to rear and side aspects, wall mounted electric heater. Double glazed window to rear aspect, wall mounted electric heater. Shower and enclosed basin, pedestal wash hand basin and low-level WC, tiled splash-backs, heated towel rail. Ceiling mounted extractor fan. Fitted with three piece suite comprising bath, pedestal wash hand basin and low-level WC, tiled splash-backs, heated towel rail. Ceiling mounted extractor fan.